Patronage – Brides, Widows, Charitable Societies, Charitable Workers, Charities, Difficult Marriages, Falsely accused People, Queens, Victims of Adultery, Victims of Jealousy, Victims of Unfaithfulness, Peace, and Invoked in times of war. 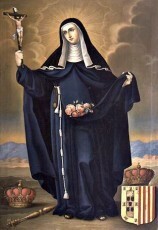 St. Elizabeth was the daughter of King Pedro III of Aragon and Constantia. She was the great-granddaughter of Emperor Fredrick II, and the great-niece of Saint Elizabeth of Hungary, for whom she was named. St. Elizabeth had a very pious upbringing, and read the daily liturgy of the hours, praying in earnest. She had regular religious instruction and education, and was learned. St. Elizabeth was married at the age of twelve to King Diniz of Portugal, and became the Queen of Portugal before she was a teenager. The King was known for his hard work, his poetic nature, and especially for his lack of morals. Elizabeth suffered through many years of abuse and adultery, praying all the while for his conversion. She spent a lot of time working with the poor and sick of Portugal. She was the mother of two – Princess Constantia, and Prince Affonso. Her husband the King, eventually reformed late in life, through the prayers of St. Elizabeth. Prince Affonso her son, rebelled against the favors that his father bestowed on his illegitimate sons and in 1323 forces of the King and his son the Prince, clashed in open civil war. Though St. Elizabeth had been unjustly accused of siding with her son against her own crown, she rode onto the battlefield between them, and was able to reconcile Father and Son, and prevent bloodshed. This led to her patronage as a peacemaker, and as one to invoke in time of war and conflict. When her husband passed away in 1325, she distributed her property to the poor and became a Franciscan Nun, and retired to a Monastery of the Poor Clares that she had founded in Coimbra. In 1336 her son, now King Affonso IV, marched against his son-in-law, the King of Castile to punish him for being a negligent and abusive husband. Despite her age and ill health, Elizabeth hurried to the battlefield at Estremoz, Portugal, and again managed to make peace in her family and thus maintain peace in her land. St. Elizabeth of Portugal was a young girl when she married. She became a Queen before the age of 12. She was abused by her husband, was the victim of jealousy from the ladies of her time, and was the victim of adultery. She spent a lifetime praying for her husband’s conversion, and was successful before his death. She was able to intercede and stop bloodshed, two separate times on the battlefield. We can learn from the life of St. Elizabeth that our prayers are heard. It may take many years, but if we stay true to the faith, pray with sincerity, over time – our prayers will be answered, in God’s time. The life of pain she endured of abuse, merited for her Heaven for all eternity. To this day – miracles are reported at her grave. Be sure to call upon her intercession on this her feast day, and she will help you.